Koblenz is a city in Germany located in the Rhineland-Palatinate. It is situated at the junction of the Moselle and Rhine rivers. The city has many historical attractions, palaces, churches and the Ehrenbreitstein Fortress that dominates the right bank of the Rhine. The Electoral Palace was completed in 1786 by the last elector of Trier, Clemens Wenzeslaus. Many of its rooms offer spectacular views of the river and the Rhine Valley. The Deutsches Eck refers to the meeting point between the Moselle and the Rhine rivers. In addition to its impressive views over the rivers and the Rhine Valley, the Deutsches Eck is also home to the impressive monument of Emperor Wilhelm I with 37 meters high. The Ehrenbreitstein Fortress was built between 1817 – 1828 on the ruins of an ancient fort destroyed by the French. In addition to exploring the ancient walls visitors can enjoy a number of museums, including the Koblenz Museum with its rich archaeological and historical collection. 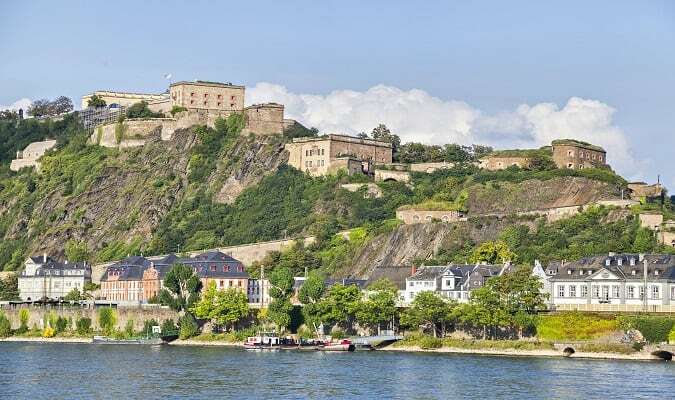 No visit to Koblenz is complete without a cable car ride up the Rhine to the Ehrenbreitstein Fortress. The cable car can carry up to 7600 passengers per hour in both directions. It is the highest transportation capacity per hour for an aerial cable car worldwide. The Forum Confluentes is a Cultural and Arts Center located in the heart of the city’s central square. The building is home to the Mittelrhein Museum with its exhibits showing the history of the city. It is also where you will find the Romanticum, an interactive attraction that takes visitors on a virtual cruise along the Rhine Valley. The Stolzenfels is located a few miles from the city center. It was built in the 19th century from the ruins of a 13th century fortress. The Basilika St Kastor is the oldest surviving church in Koblenz. It was the scene of many important historical events. The building dates from the mid-12th century. The Liebfrauenkirche was built on the highest point of the old city. From the late Middle Ages until the French Revolution it was the main parish church of Koblenz. Its origin dates back to the 5th century. It has been rebuilt and expanded several times using its original bases. The Alte Burg is located on the banks of the Moselle. It is a 13th century castle that served the electors of Trier. Today the Alte Burg houses the Stadtarchiv. The Mercure Koblenz is located on the banks of the Rhine. Rooms are equipped with a flat-screen TV, work desk, safe. The Diehl´s Koblenz is located 1,5 km from the Electoral Palace. Rooms are equipped with a flat-screen TV, minibar. Galeria Kaufhof is a German department store chain with many stores in Germany. The company features brands like Esprit, S. Oliver, Tom Taylor, Gerry Weber, Tommy Hilfiger, Bugatti, Olymp. The Loehr Center is located 950 meters from the Central Station. Brands: Swarovski, Pandora, New Yorker, Douglas. The Forum Mittelrhein is located 750 meters from the Kurfürstliches Schloss. Brands: Adidas, Mango, New Yorker, Pandora, Douglas, Saturn. Koblenz has easy train access from various cities in Germany. Famous cities nearby: Frankfurt, Wiesbaden, Cologne, Bonn.